What May Christians Safely Disbelieve? My Roman Catholic friend, Michael Liccione, has written on his Facebook page that "the main disagreement among American Catholics is not about whether we should believe 'all that the Holy Catholic Church believes, professes, and teaches,' but which teachings we may safely disbelieve." I responded, "Aggiornamento has that effect on us! There is an interesting parallel between the Roman Catholic Church in the USA and the Anglicans in the USA in that liturgical reform suggested to many that the historic Catholic faith had changed. The Vatican II liturgical changes and the Episcopal Church's 1979 prayer book changed words and forms. If lex orandi lex credendi is true, we should not be surprised that Roman Catholics and Anglicans have to decide what they may safely disbelieve." Dr. Peter Toon believed that the Anglican formulary had a fixed shape that was worth preserving because it was Biblically sound and preserved the distinctive Anglican Way. He had no problem with the slight changes in wording and order that were found across the various revisions up to the 1979 "Book of Common Prayer" produced by the Episcopal Church. He noted that the 1979 book did not conform to any of the previous versions. This concerned him and it concerns other Anglicans who believe that the form of something received should not be set aside because form is an important as the words prayed. The Anglican priest Louis Tarsitano wrote, "The rejection of formulas as the prescribed means of defining, maintaining, and manifesting forms is especially dangerous in theology and religion, upon which all other human activities depend for the maintenance of their forms according to God’s good pleasure. The new life given in Christ Jesus is governed by divine forms, just as much as the originally righteous life of man that redemption restores was formed in every particular by God." How one views the changes that came out of Vatican II and the Episcopal Church's Standing Liturgical Commission (SLC), will depend on whether one agrees with the premise of the Liturgical Movement that the divine liturgy needed to be updated or modernized (aggiornamento). Urban T. Holmes seems to have understood that the 1979 prayer book would divide Anglicans in the United States, or at least that it had far-reaching ramifications. He wrote, "It is evident that Episcopalians as a whole are not clear about what has happened. The renewal movement in the 1970s, apart from the liturgical renewal, often reflects a nostalgia for a classical theology which many theologians know has not been viable for almost 200 years. The 1979 Book of Common Prayer is a product of a corporate, differentiated theological mind, which is not totally congruent with many of the inherited formularies of the last few centuries. This reality must soon ‘come home to roost’ in one way or another." The new book was predicated on an assumption that "classical theology" has no relevance to people of the 20th century. Further, he admits that the incongruence between the theology of the 1979 book and traditional Anglican theology is sufficiently great that it will raise objections and bring division. As I reflect upon the educational process that has brought the Episcopal Church to the 1979 Book of Common Prayer, it seems clear that it is a symbol of a theological revolution, which is a victory for none of the old "parties" that those of us over 40 remember so vividly from our youth. The new prayer book has, consciously or unconsciously, come to emphasize that understanding of the Christian experience which one might describe as a postcritical apprehension of symbolic reality and life in the community. It is consonant with Ricoeur's "second naivete" and is more expressive of Husserl, Heidegger, Otto, and Rahner than Barth or Brunner. It embraces a Logos Christology. This viewpoint was shaped liturgically at Maria Laach, transmitted to Anglicanism by Herbert, Ladd, and Shepherd, and reinforced by Vatican II and a cluster of theologians and teachers who are, directly or indirectly, part of the theological movement reflected in that most significant gathering of the church in the 20th century. This is one of the most revealing of Holmes' reflections on the liturgical reform of the Episcopal Church. The changes were informed by 20th century philosophical developments rather than by Scripture, Tradition, and the Fathers. As one who has been teaching Husserl, Heidegger and Derrida for more than 14 years, I can say that they have much to offer to theological conversation, but we should not regard them as authorities when it comes to liturgy, worship and prayer. Roman Catholics and Anglicans alike give lip service to lex orandi lex credendi. We recognize that how we pray shapes how we believe. To express it another way: what we pray influences what we believe. In turn, both how /what we pray and how/what we believe shapes how we live. If you believe form/shape is not as important as words, you can easily embrace the liturgical changes of the 1979 prayer book. However, if you believe that lex orandi lex credendi is true, you are less inclined to dismiss or sideline the older form. No doubt the Roman and Anglican liturgical reforms brought some good things, but the question remains: Were these minor gains worth the price of losing continuity with the older, richer tradition? Were the changes really necessary? Is this a different religion? It is not a coincidence that the move to ordain women as priests came in the Episcopal Church with the "updating" of the liturgy that we find in the 1979 book. Likewise, with the post Vatican II liturgical changes in the Roman Church came a movement called "Women Priests" and just as the first women ordained in the Episcopal Church were ordained against the canons of the church, so some women of the Roman Catholic faith have taken it upon themselves to be ordained Catholic "priests" against the canons of Rome. See a pattern? Lex orandi lex credendi. Words matter. "Regeneration" is one of those words that matter very much in traditional Anglican baptismal theology, but the word does not even appear in the 1979 prayer book. Forms matter as much as words. None should be forced to worship according to a form that is incongruent with, and at times quite foreign to what has been preserved and received through many generations. The Vatican came to see this and now permits the use of the old Latin Rite. It is reasonable to question the premises of the liturgical reform movement. It brought sweeping changes and, though the 1979 book is a sacred cow for many, it is not the recommended book today among Anglicans who seek to recover the Anglican identity that is reformed, catholic, and distilled from Scripture. Such faithful sons and daughters may safely disbelieve the tenets of the Episcopal Church's new religion. Related reading: Rethinking "Biblical Equality"; How Radical a Revision? ; A Review of Worship Points the Way; Joseph Ratzinger Predicted the Crisis; New Anglicans Keep "the Main Thing the Main Thing"
What is the Third Commandment? What does it mean not to take God’s Name in vain? Comment: The Semites in Jesus' time believed that a person whose name was spoken with reverence and love was actually present to one speaking the name. This belief was also held by the early Christians. In the monasteries it became the practice during prayer for monks to synchronize their breathing with the repeated invocation of the holy name of Jesus. During the theophany at the burning bush (Exodus 3) God declares, "I am that I am" (Ehye aser ehye). The entire narrative is limited to the location of this mountain sacred to the Horites in that region. Moses' father-in-law Jethro was the ruler-priest of Midian. His status is designated by the initial solar symbol: Yetro. He is a descendant of Abraham’s son Midian, born to his cousin wife Keturah. God tells Moses that the sign by which he will now that it is the Lord who sent him would be his return to worship once again on that mountain. And He said, "Certainly I will be with you, and this shall be the sign to you that it is I who have sent you: when you have brought the people out of Egypt, you shall worship God at this mountain." Then Moses said to God, "Behold, I am going to the sons of Israel, and I will say to them, 'The God of your fathers has sent me to you.' Now they may say to me, 'What is His name?' What shall I say to them?" God said to Moses, "I AM WHO I AM"; and He said, "Thus you shall say to the sons of Israel, 'I AM has sent me to you.'" Moses is concerned that his Habiru (Hebrew) people might not recognize the Lord. To this God responds that Moses is to tell them that he was sent by "I Am" and yet when Moses tells Pharaoh that it is Yahweh who commands that the people be allowed to go three days journey into the wilderness to worship, Pharaoh appears to be familiar with the Holy Name. In Exodus 3:15 we find the narrative as a polished creed: "And again Elohim said to Moses 'You shall say this to the sons of Israel, Yahweh Elohi of your fathers, Elohi of Abraham, Elohi of Isaac and Elohi of Jacob, has sent me to you. This is my name forever and this is my title from generation to generation." Here the divine name Yahweh is associated with another divine name: Elohi/Elohim, as in Genesis 24:7. It is evident from these references that there were various names and attributions for the Creator among the Habiru. These include El, Elohi, Elyon, El Shaddai, I Am, and Yahweh. Abraham bargains with Yahweh over the fate of Sodom (Gen.18:1). He utters the name Yahweh in Genesis 24:3 and 24:7. In the latter instance he recognizes "Yahweh Elohim" as the one who called him out of Mesopotamia. Hagar the Egyptian recognizes her angelic helper as the angel of Yahweh (Gen. 16:7), and Abraham's servant invokes the help of Yahweh no less than ten times in his quest for Isaac's cousin bride. Numerous ancient seals include the holy name Yahweh or the element Yahu. Yahu seals were used to identify kings and ruler-priests of Judah. There are many ancient seals that bear such inscriptions. They have been found in Ethiopia, Judah, Samaria and Jordan. One seal appeared on the lintel of a priest’s tomb at Siloam in Jerusalem. His name appears as Shebna-yahu and he was the High Priest Shebna. Shebna is mentioned in II Kings 19:2. Another seal with the divine name is from the 7th century B.C. and names Hanan, son of the ruler-priest Hilqiyahu. Hilqiyahu is better known as Hilkiah, the High Priest who served during the reign of Josiah. He is mentioned in II Kings 22:8. Two hieroglyphic references dating to 1400 B.C. refer to “the land of the Shasu of YHW.” These are the oldest references to Yahweh outside the Bible. The "Shasu of YHW" is found on inscriptions from the Nubian temples of Soleb and Amara West and corresponds to the Biblical name Yahweh. More than any other name for the Creator, the name Yahweh came to express the divine nature: eternal, immutable, incorruptible, sovereign over all, jealous for his people, commanding obedience, purity, mercy and justice. This God is holy and so is His name. How can you use God’s Name irreverently? Comment: In the ancient world assertions made in court, in public deals, and even in ordinary conversation were often backed up with conditional self-curses. These curses were believed to take effect if the one swearing the oath failed to fulfill the terms of the contract or if their testimony proved to be false. Typical assertions were: “By the life of the Lord I will (or will not)…” or “May the Lord do such and such to me if I do (or do not…). These oaths were a serious matter. A false oath showed contempt for God. The commandment appears in a slightly different form in Leviticus 19:12 – “You shall not swear falsely by My Name, profaning the name of your God: I am the Lord.” This is why our Lord Jesus, in the Sermon on the Mount, commanded: “Swear not at all” (Matt. 5:34). How can you use God’s Name lightly? As we confess that vain and rash Swearing is forbidden Christian men by our Lord Jesus Christ, and James his Apostle, so we judge, that Christian Religion doth not prohibit, but that a man may swear when the Magistrate requireth, in a cause of faith and charity, so it be done according to the Prophet's teaching in justice, judgment, and truth. Comment: It is evident that swearing an oath using God’s name was a practice in the 16th century or this Article of Religion would not have been necessary. First established in 1563, the articles served to define the doctrine of the Church of England as it related to Calvinism and Roman Catholicism. Late Elizabethan drama contains a profusion of oaths using the words Jesus or God. Swearing on stage was so common that it was officially banned by the Act to Restraine Abuses of Players in 1606. Examples include 'slid for "By God's eyelid" (1598) and 'sfoot for "By God's foot" (1602); Gadzooks for "By God's hooks" (the nails on Christ's cross) and, egad for “oh God” in the late 17th century. How can you honor God’s Name? Comment: Christians should be people of integrity. We should not enter in contracts or marriages, or commitment to serious endeavor lightly. Our word should not be flippantly broken. A Biblical view of promises calls us to a higher commitment to our word and involves calling upon God for help, but not uses God’s name in a profane way. We need God’s help to "tell the truth, the whole truth and nothing but the truth..." or "to faithfully execute the office of the President of the United States..." "to be my lawful wedded wife” and “to promise and covenant before God and these witnesses to be thy loving and faithful husband, in sickness and in health..."
In the Book of Common Prayer the people of the local parish are called upon to do all in their power to support the newly married couple in upholding their promises. 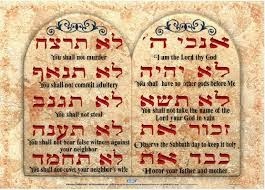 The Ten Commandments constitute the heart of the Law. They are of universal application while the ceremonial or ritual laws applied only to Israel and to those who attached themselves to Israel. These made the Habiru/Hebrew unique among the other peoples of the ancient world. They were known to be fastidious in the performance of their religion. The truth can be known because God has revealed truth by various means and most especially in the person of Jesus Christ. One measure of truth is the divine moral code delivered to the Hebrew people through righteous rulers appointed by God. Among these righteous men were Enoch, Abraham, Job, Moses, and David. Analysis of the kinship of the Horite rulers named in the Bible reveals that all these were of the ruling lines that can be traced back to the Neolithic rulers named in Genesis 4 and 5. These are the rulers to whom God made the first promise of Scripture in that a Woman of their lines would be overshadowed and conceive the “Seed” of God who would crush the serpent’s head (Gen. 3:15). Jesus claims to be this Seed in John 12. Speaking of his death, the Lord told his disciples, "The hour has come for the Son of Man to be glorified. Truly, truly, I say to you, unless a grain of wheat falls into the earth and dies, it remains alone; but if it dies, it bears much fruit." Paul makes this connection in Galatians 3:16 and 29: Now to Abraham and his Seed were the promises made. He saith not, and to seeds, as of many; but as of one, and to thy Seed, which is Christ… And if ye be Christ’s, then are ye Abraham’s seed, and heirs according to the promise. None of the Hebrew/Habiru rulers fulfilled righteousness perfectly. That can be said only of Jesus Christ. He embodies the righteousness of the Law and he fulfills the Law. His sacrifice and resurrection are proof that He is the long-expected Righteous Ruler. The proof of that is His resurrection. Some laws attributed to Moses were already observed by Jesus’ ancestors who served as priests at the most prestigious shrines of the ancient world. Two of these – Nekhen (Hierakonpolis) and On (Heliopolis) were on the Nile during the African Humid Period (Neolithic Subpluvial). These have been definitively identified by archaeologists and anthropologists. The people living there had a distinctive red skin tone like that of the rulers of Edom: Abraham, Seir the Horite (Gen. 36), and later the Nabataeans of Idumea. Idumea was the Greek word for Edom. It means "land of red people." Jesus is a direct descendant of these Horites (what Jews call their "Horim"). Their red African ancestors were a cattle herding people who sacrificed calves. Abraham sacrificed a calf when the Lord in three persons visited him at Mamre (Genesis 18). In Numbers 19:9 we read of a statute that Jews selectively ignore though it pertains to a "perpetual sacrifice" of a red calf outside the camp for the purification of the people. This points to Jesus, the Calf of God, who like David and Esau had a red skin tone. He is the red calf sacrificed “outside the camp” for the purification of the people. Lord, incline our hearts to keep this law. Increase in us the yearning to love you more perfectly. Write these commandments on our hearts that we may fulfill your law through the power of the Holy Spirit. Amen.